Is it Okay to Uninstall 'Extra' Versions of Microsoft Visual C++? 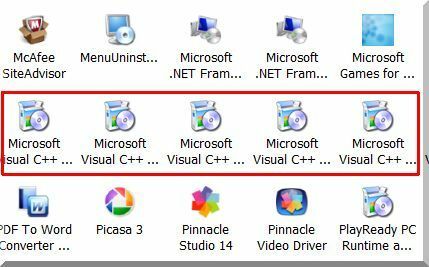 Q&A: Restoring Hidden Icons, Okay to Uninstall Visual C++ Versions? "I use Revo Uninstaller. Under Programs Present I see many different versions of [Microsoft Visual] C++. Can I delete some of them without messing up my PC?" I'm a Revo user, too, Don, and I've seen firsthand what you're talking about. Of course, even running Windows' own program uninstaller can reveal multiple instances of Microsoft Visual C++ Redistributable, often with diffferent years and version numbers. On my system, in fact, I count 13 of them. It's logical to think that Windows probably needs only one of these versions--the most recent. And it's also logical to think that by clearing out the older ones, you'll reclaim some hard drive space and maybe lighten the Registry's load a bit. My advice: leave those C++ installations alone. The reality is that they're small, usually no more than a couple megabytes, and different versions may be linked to different programs you've installed. It's darn near impossible to know which one is associated with which, and deleting one might render a program inoperable--a hassle you definitely don't need. I totally get the appeal of sifting through your uninstaller in search of programs you can send packing. However, when in doubt, don't throw it out. Instead, if you're looking to optimize your system, free up some drive space, etc., try a utility like Advanced SystemCare 5 Free. It works pretty well, and it's less likely to delete something you'll need.